No flowers were reported missing at a self-service flower shop in Longgang District during the Spring Festival when the shop owner was away for the holiday, the Shenzhen Special Zone Daily said yesterday. 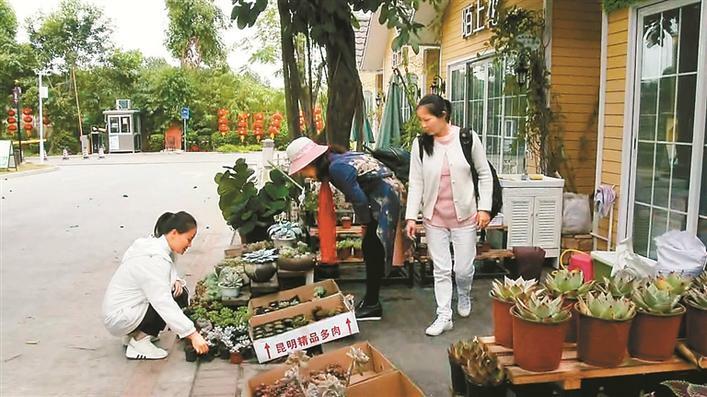 The self-service flower shop in Longgang’s Lily Flower Town remained in business during Spring Festival holiday, although no staff were seen manning the shop. Flowers for purchase are allocated at the front of the shop with price tags with discounts. Customers who want to buy the flowers paid by scanning an on-site QR code. Many shoppers said that being trusted to make the transaction unsupervised was appreciated , the report said. A shopper identified by his surname Zhao told the Daily that he can sense that the shopkeeper has trust in customers to pay honestly as there was not even a camera present. It all depended on customers’ honesty. As a customer, he said that he was willing to buy flowers to show his respect for the shopkeeper. “I was hurrying back to my hometown for the Chinese New Year (CNY),” the shopkeeper surnamed Wang, who just returned from her hometown in Hunan Province, told the Daily. “However, I did not want to miss out on business when I wasn’t in the shop, so I created this solution. To my surprise, no flowers were stolen and I had received payment for 33 transactions in total. Shenzheners are very honest,” Wang said. Wang said that she was inspired by some foreign flower shops she saw when traveling overseas, which are normally closed during weekends but still provide a self-service option for customers. However, Wang said that this mode of selling is only suitable for plants that do not require daily care. Wang prepared gifts such as red packets, succulent plants and hand-made soaps for her self-checkout customers to show her thanks. She also revealed a plan to continue this service during weekends in the future, the report said.